The Daycare Success System is the best resource you’ll find for how to start a daycare business, or how to get your daycare more profitable. 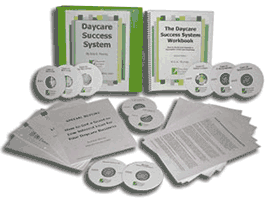 It is by far the most complete and easy to understand system for starting a daycare on the market today. You will receive the Daycare Success Workbook, the 2-hour audio companion to walk you through the workbook step by step, 6 hours of expert daycare interviews along with transcripts of the chats, 34 daycare business forms, and much more! Simply put, this is “daycare success in a box”!Available in shipped hard-copy format, or as a digital download to your computer. 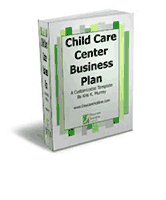 It’s important to have a business plan, especially if you are building or purchasing a child care center. So I’ve provided you with a sample business plan for a child care center to get you started fast, writing your business plan. Simply insert your daycare business name into the document and presto, you’re well on your way to a business plan! Provided as a Microsoft Word template that you can edit to fit your needs. This will save you many hours of time! It’s important to have a business plan, even when you operate your daycare out of your home. 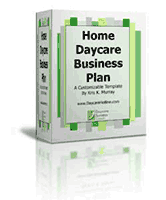 I’ve provided you with a sample business plan for a home-based daycare business to get you started fast, writing your business plan. You can simply insert your daycare business name into the document and presto, your business plan is well on its way! 34 essential daycare forms that you can use and modify, for running your daycare! These forms alone will save you DOZENS of hours of time. All forms are supplied to you instantly in Word, Excel and PDF formats. 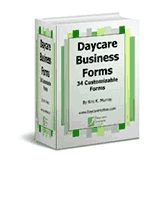 Many other daycare owners have used these forms and they absolutely RAVE about them! 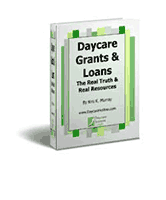 One of the things I get asked most often is, “Are there really grants out there for starting a daycare, and how do I get one?” I wrote this special report to answer this often-asked question and to provide you with the REAL secrets to getting a grant or low-interest loan! I’ve provided a sample policy handbook that you can use and edit to fit your own daycare business. This policy handbook will save you tons of time and headaches by making your rules and policies crystal clear to your clients!